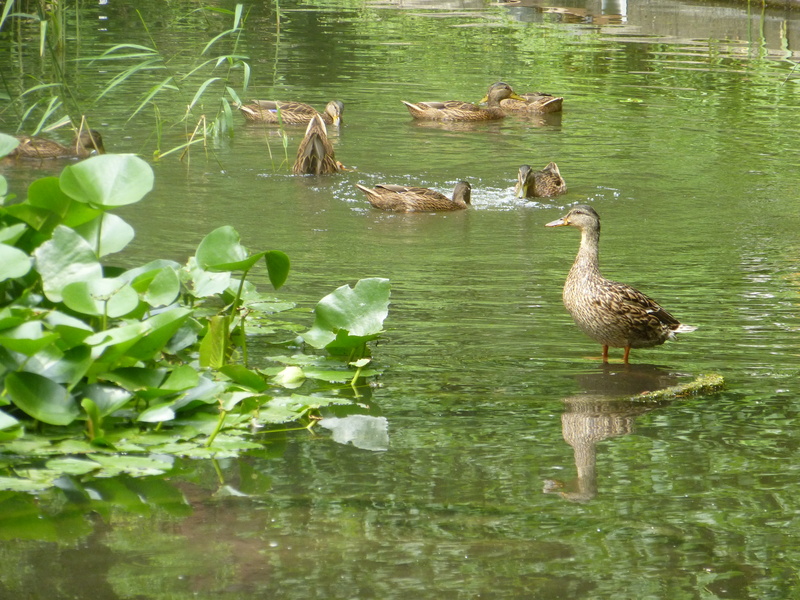 It’s a steamy Friday, and the ducks are wilted, napping on their island. Their appetites even seem to have flagged, though they may just be foraging on their own. 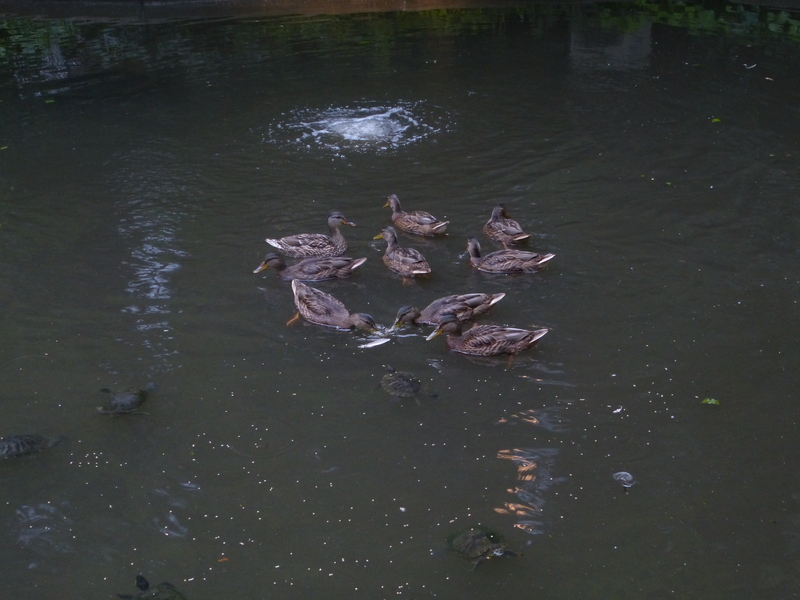 All eight ducklings are in good nick, and their wings are getting large; they even flap them just to test them out. 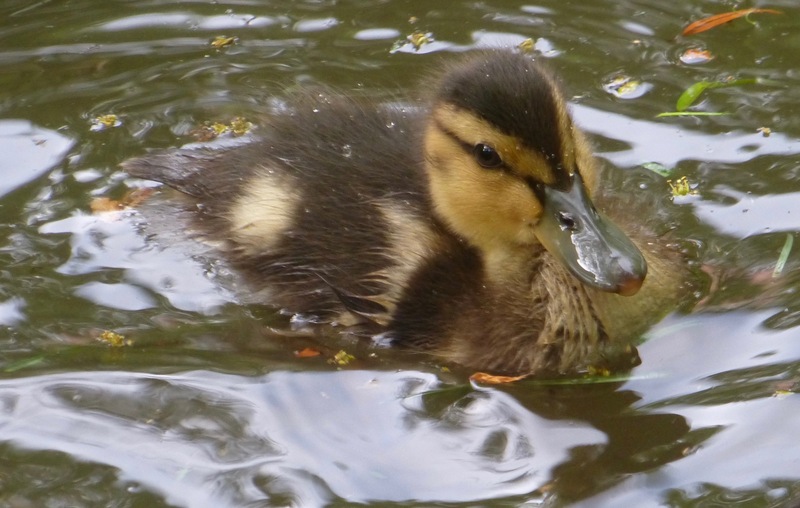 It won’t be long now, and I wish dearly that I could see a duck’s first flight. That’s not likely, but I’m enjoying my last few weeks with them. Here are a few pictures taken yesterday and today. This is what I encountered yesterday morning after whistling. 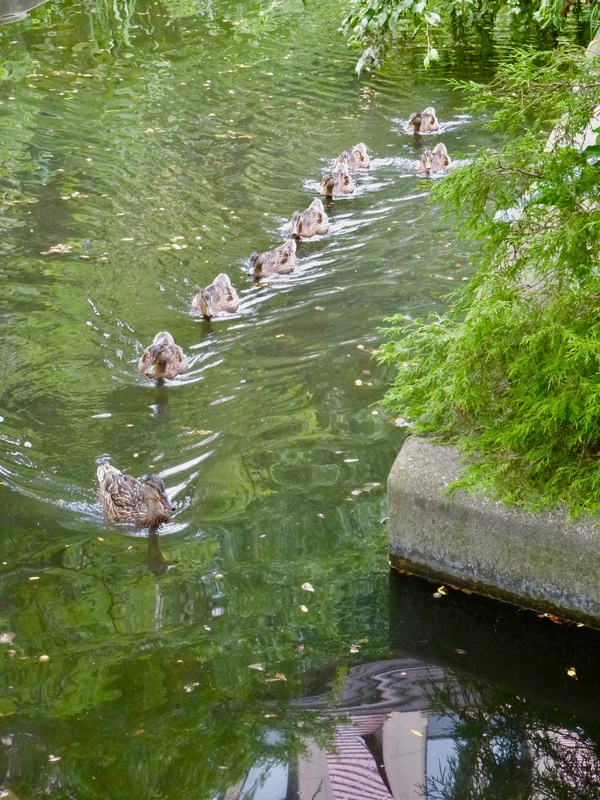 They all swam toward me in a line, with Honey bringing up the rear. I suspect Honey’s following position helps her keep a better eye on her brood. Mealworm and duck pellet time. You can pick Honey out because of her whiter tail (top), but I swear that she’s not much larger than her offspring now. 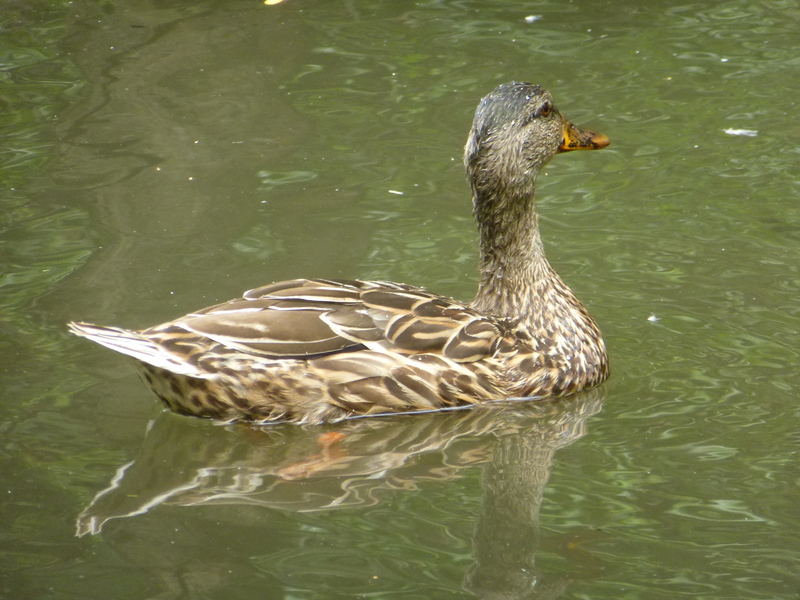 The Good Mother Duck. I think she looks fine—not too skinny since I’ve been feeding her up. Spot the hen! I’m wondering if Honey hasn’t started her molt already, as that looks like a primary feather on the island behind her, and her wings look shorter. Birdy readers, what do you think? Finally, feeding time in this morning’s darkness. Turtles abound, cleaning up the uneaten mealworms and pellets, so nothing is wasted. Can you spot Honey here? 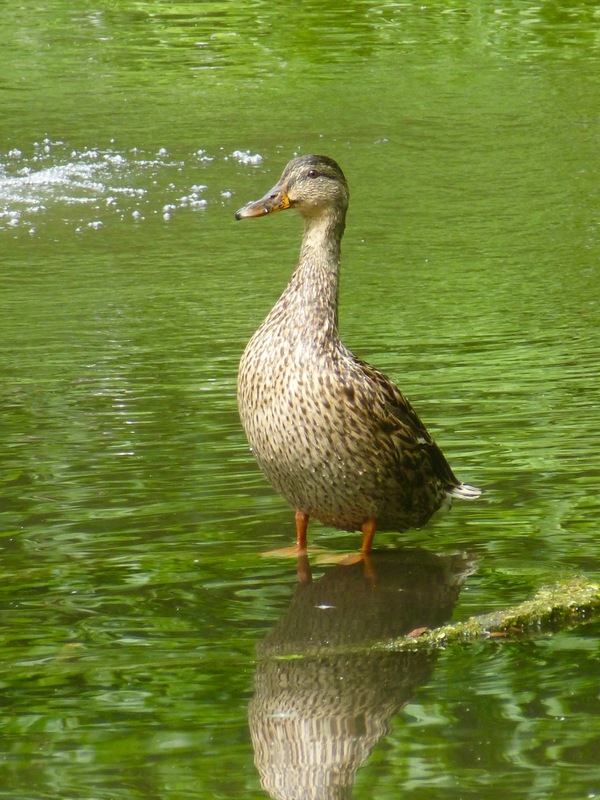 This entry was written by whyevolutionistrue and posted on July 13, 2018 at 2:45 pm and filed under ducklings, ducks. Bookmark the permalink. Follow any comments here with the RSS feed for this post. Both comments and trackbacks are currently closed. Pretty sure the ducks know when to go. Not like humans. Yes, probably. However, there are many species where the kids try to stick around until they’re pushed out by mom and/or pop. We are not alone in that. I have been watching a Family of Bald Eagles, the three Eaglets fledged about a month ago, but they are still hanging around and being fed by Mum, and they will try to take the fish out of her Talons in mid air. I suspect it won’t be long before they leave for good, once they have learned to Fish, and as the nest is next to a Trout Farm, they should soon learn. Interesting how certain animal behaviors parallel human ones. Got to kick those moochers out while still protecting their genetic heritage. Its always tough to catch a child’s first step, I doubt that out of the dozens of cockatiels I’ve raised that I ever saw one’s first flight. 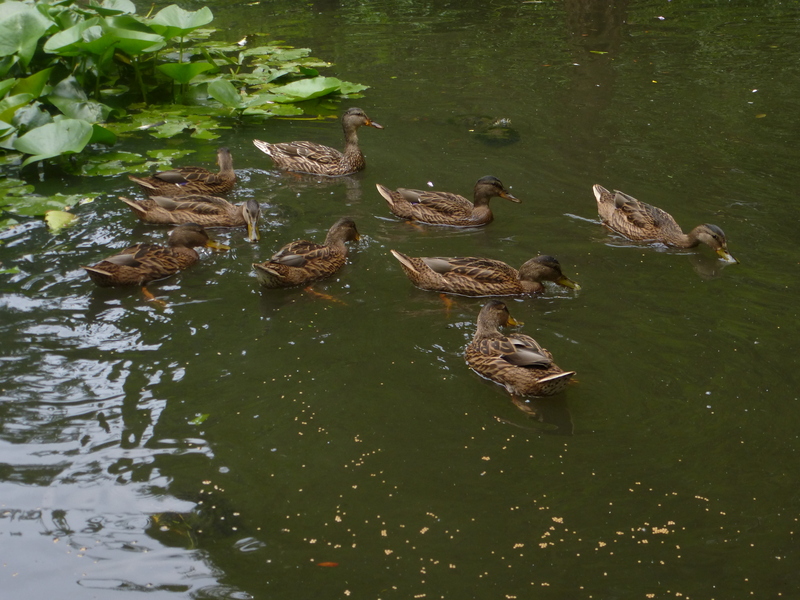 Honey is the one on the upper left facing the ducklings. Honey is looking very fit and healthy. 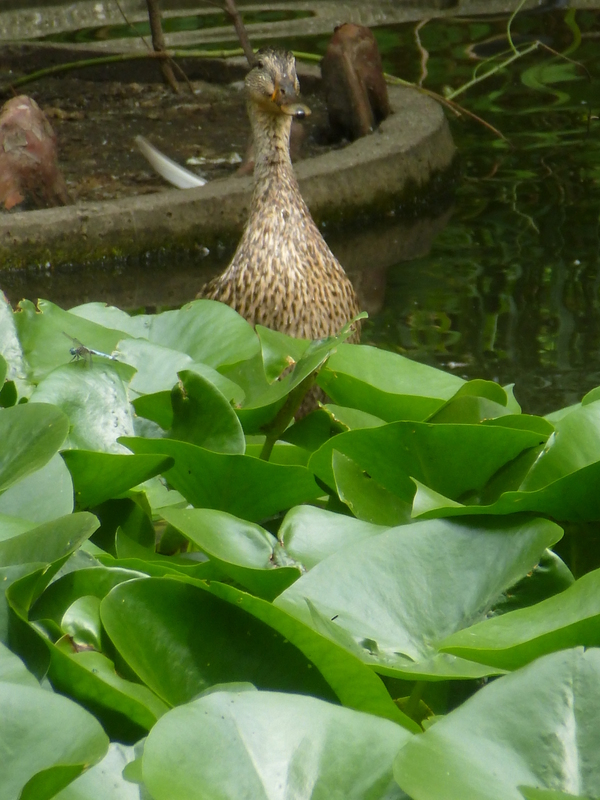 I remember the heron that hanged around a while ago, harboring hopes for a duckling snack. Now, with their sizes, he wouldn’t bother even to slow down. Marvelous! I hate the word “heartwarming”, so I won’t use it. Or did I just do so? Honey looks a very content duck. They haven’t yet fledged and already I’m missing them. You have a fine family, PCCE.